Finally got to shoot the 450B today. The barrel is a 17.5" varmint. It does show some decent accuracy, but I think I will need a Ross brake on it to shoot it well. Recoil was not bad but the barrel really jumps up and my wrist is sore after about 25 rounds. I will post pics after I get the brake and paint it up. It is a fun project though. Loads were with 240 XTP Mag and IMR 4227.
snowgetter1 wrote: Finally got to shoot the 450B today. The barrel is a 17.5" varmint. It does show some decent accuracy, but I think I will need a Ross brake on it to shoot it well. Recoil was not bad but the barrel really jumps up and my wrist is sore after about 25 rounds. I will post pics after I get the brake and paint it up. It is a fun project though. Just be careful not to main-line that 4227, the addiction is gonna get ya..wink.. I really like the imr 4227! Here is a pic of the Striker. 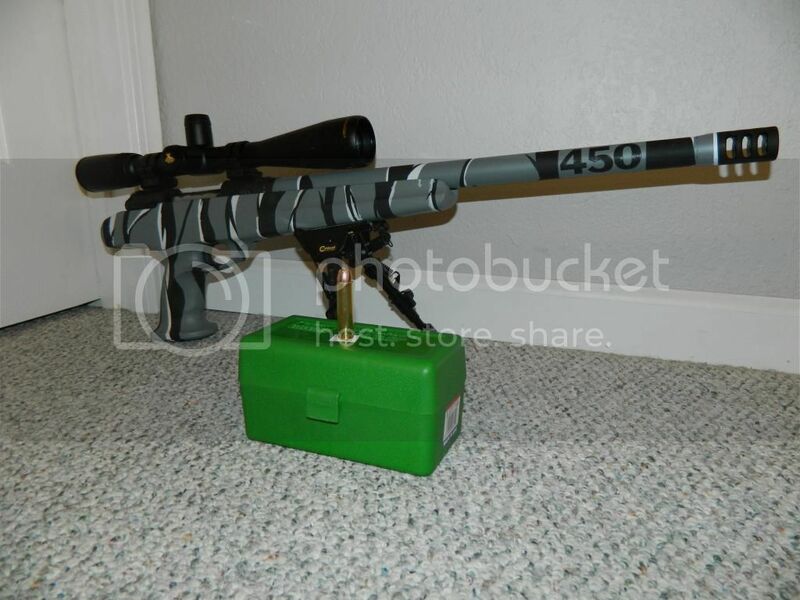 The barrel on it here is a 243, but the 450B barrel is the same. 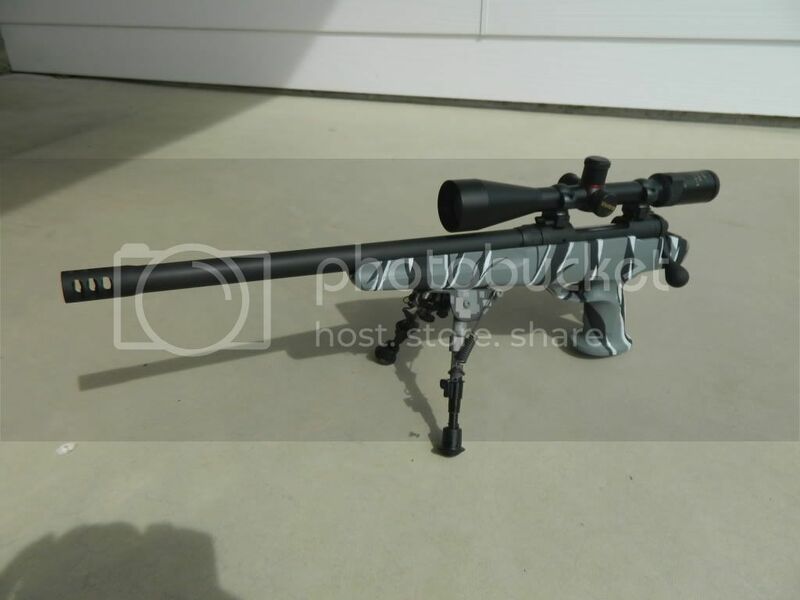 I have also replace the scope with a Nikon Buckmasters 6x18. Not sure why my pic was cut in half? Sorry. It was loaded from photobucket. Thats awesome! care to share the details on your build? Got the barrel from Apache Gunworks off Ebay. The pic is a savage 243 varmint barrel cut down to 17" with a Ross brake on it. I also have a new 6x18 Buckmasters scope on it now. The paint is Duracoat flat black and ACU gray. The strikers are just flat out addicting especially with large caliburs. My only wish is I had more than 2 since I change barrels on the 243 one alot. Here is my other one in 30 Bellm for Illinois legal deer hunting. The paint is also Duracoat. The worked and painted 450 Bushmaster is ready to go. Many thanks to Ross for the one week turn around on the muzzle brake. Excellent work. And thanks to Apache Gunworks for the barrel. I believe that is what you call "a handful"! I want to see a video of you shooting that! Are you in The DFW area? Bring that beast out to my range and let's make a video!